Director David keating: Film director and screenwriter, His writing includes work for Columbia/Sony Pictures and Jim Sheridan’s script for INTO THE WEST. Director: THE LAST OF THE HIGH KINGS, (Miramax / IFB) with Jared Leto, Gabriel Byrne and Christina Ricci. WAKE WOOD (Hammer / IFB) with Aidan Gillen, Timothy Spall and Eva Birthistle. CHERRY TREE (MPI / IFB) — with Naomi Battrick, Anna Walton and Sam Hazeldene. CHERRY TREE was selected to open Film4 Frightfest 2015 in London’s Leicester Square, it had its US premiere at Lincoln Plaza in NYC November 2015. Reception: Millennium Theatre Foyer LIT 18:00 – 19:00 – All Welcome. 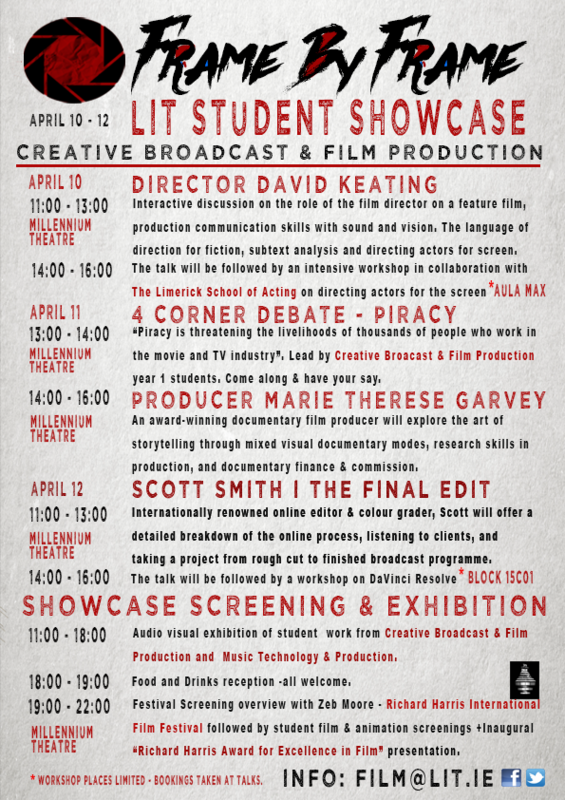 Screening: Festival Screening overview with Zeb Moore – Richard Harris International Film Festival followed by student film & animation screenings + Inaugural “Richard Harris Award for Excellence in Film” presentation.